Their 6 year Parts & Labor Warranty is further evidence of their confidence in their product. Go ahead, ask around to see if other manufacturers back their product like they do their. That's why we are proud to be an authorized dealer. They exclusively use Waterway pumps on all their Viking spas. In the Aurora, Supreme, Legacy, Legend & Heritage Series, they use Waterway’s Executive Series 56 frame pump. The Executive Series runs as much as 50% cooler than the commonly used 48 frame pump and is also one of the most energy efficient in the industry for its size. 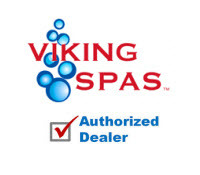 Viking spas are also available with a 5.5 kilowatt heater! This is a very important feature that separates them from many spa brands. With a higher kilowatt heater your spa will heat up faster and most importantly maintain the exact temperature you like to relax with. Lastly, Viking Spas has set a new industry safety standard in single pump systems by using two bottom side suctions in conjunction with pool-style weir skimmer on all of their spas. Rest comfortably knowing that they place their own children in their spas and know what it takes to make them safe. That is why they are proud of their TUV listing.